Mission Statement: The Mission of the Wounded Warrior Mentor Program (WWMP) is to assist Wounded/Ill and Injured including Spouses to transition to a new productive life and profession using education, internships and jobs as the mantle to accomplish this. The WWMP matches volunteer Mentors with Wounded/Ill and Injured at Walter Reed NMMC and Ft Belvoir as well as other facilities in other parts of the U.S.
Mentors work with Wounded Warriors to help them prepare for life after leaving the military or for a new military career. Mentors help Wounded Warriors identify education, internship, and employment opportunities and assist them in identifying and accessing benefits and other resources. 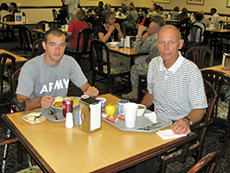 After they leave the military treatment facility, WWMP can often put Wounded Warriors in touch with a volunteer Follow-On Mentor near their home towns. These Follow-On Mentors can assist Wounded Warriors and their families as they transition to new, productive lives. While there is no fixed time frame, Follow-On Mentors often work with Wounded Warriors and their families for several years. WWMP is an all-volunteer program and is not part of any Federal program. Participation in the WWMP is voluntary on the part of Wounded Warriors. There is no charge or obligation associated with participation in the WWMP. Please be sure to differentiate between the “Wounded Warrior Project (WWP)” and our “Wounded Warrior MENTOR Program (WWMP)” – two entirely separate “charitable organizations’ (aka IRS certified 501 ( c ) ( 3 )). Do not confuse them, please! WWMP IS NOT WWP!!!! WWMP does not solicit funds from anyone! All, approximately 200 plus WWMP members do not get paid—NO ONE IN WWMP GETS PAID!! 100% volunteers. Information on becoming a volunteer Mentor, as well as resources for Mentors, family members, and Care-givers. Please use the Contact Us Form to send your suggestions for improvement. They are encouraged. The Search function will locate the website page that contains the words you enter in the search here box. Click on that page and then scroll until you find the article you are looking for.